So many things I'd like to do aren't realistic at all, and others I'm already working on. But a big goal? A major achievement for the year? 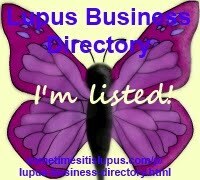 I'd like to see awareness of the Lupus Business Directory spread. I'd like it to be something people use regularly - that maybe even they check if there's a business in the directory producing what they're looking for before they look anywhere else. There are a number of problems with setting that as a major goal. I don't know how to measure whether I've succeeded. It's not something I can do on my own - I don't have a budget for an advertising campaign, so I'm reliant on word-of-mouth, on people telling other people and sharing on social media. I don't know how I would measure, but I really would love to discover that my little project really did make a difference for people struggling with the financial burdens of chronic illness. If you know of any businesses (or have one) owned/run by people with chronic illnesses, please email me the details. Please share the Lupus Business Directory link with your friends, and tell them about the goal of helping people with chronic illnesses to earn their own income. This post was written as part of Wego Health's National Health Blog Post Month.